About 1,300 West Virginia eighth graders danced, laughed and cheered Wednesday in Charleston at the kickoff event for a program to get kids from disadvantaged areas and backgrounds into college or other post-high school training — and take others with them. Last year, the U.S. Department of Education granted the Mountain State $21 million in its third Gaining Early Awareness and Readiness for Undergraduate Programs (GEAR UP) grant, according to Jessica Kennedy. Kennedy — director of communications and outreach for the Division of Student Affairs, part of West Virginia’s public higher education agencies — said the GEAR UP grant will serve 17,000 students over seven years, with a specific focus on about 3,100 current eighth graders whom it will aid each year of the program. Many of those students, representing 32 schools in 10 counties, filled a Clay Center auditorium Wednesday. 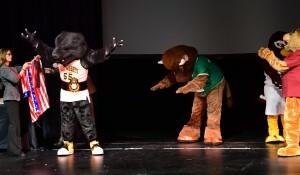 They did the popular “Whip/Nae Nae” dance as college mascots from Concord, Fairmont State, Marshall and West Liberty universities led them onstage. The students also listened to a motivational speaker who tore off his shirt to reveal a Superman outfit midway through a talk in which he said they could overcome troubled upbringings to be successful. Three students also won $250 college scholarships in a random drawing.